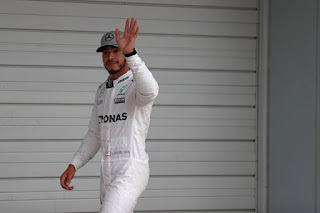 As outlined Lewis had a nose ahead of his rival pretty consistently in this weekend's running, though it did briefly threaten to get interesting at the very last of quali, particularly as Nico was ahead after the first sectors of their final efforts. 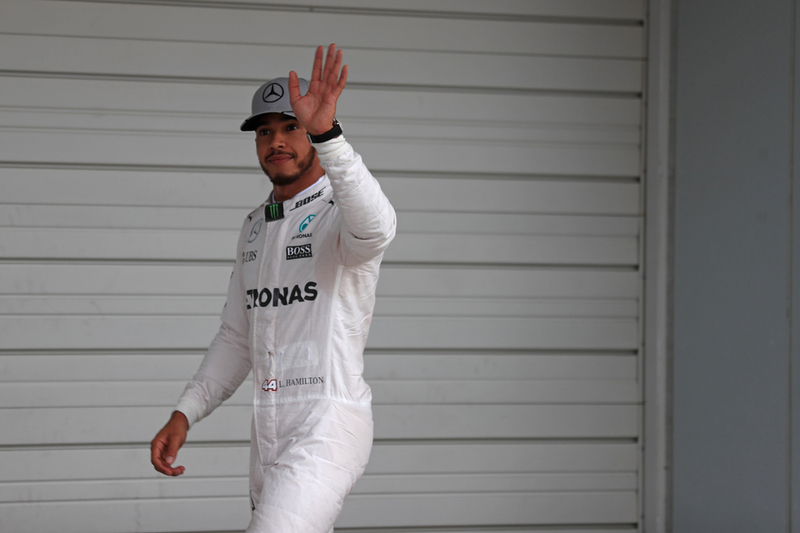 Lewis reasserted the order though, being quicker in the other two parts of the lap and ended up a clear tenth ahead. Nico whatever else was going on this time though had fought a good fight. Unlike in the previous two there was a conspicuous sense of him pushing Lewis for this one. Someone or other pointed out afterwards too that had Nico strung his best sectors together pole would have been his. It didn't entirely feel that way however, and Lewis insisted he didn't feel under great threat. "I felt quite comfortable in qualifying, as I have done all weekend to be honest" he said. "Nico has been getting quicker and quicker but I've generally had it covered throughout the weekend. "And today every session I was up in front and able to maintain it each time, and go out and find more time each time I went out. "This is one of those shorter circuits that the smallest margin [is vital], it's usually a lot closer here...It is a very tricky circuit. "My first sector, all weekend actually it was quite good and then it kind of didn't get as good at the end, but then my middle and last sectors were very strong." Nico meanwhile focussed on how close it had got. "It was very close and that's why it's a little bit disappointing, as one tenth you always think 'I could have pulled out a tenth maybe'...but that's the way it is." Or perhaps, some surmised, Interlagos simply is saving up all its habitual fun for tomorrow, when weather forecasts are if anything more foreboding than today's. It all could serve to render what we've had up until now in Brazil irrelevant. As we know here both sprinkles and deluges are possible and both have equal ability it seems to mess with the best laid plans. And in an odd sense both Merc pilots will see such a prospect as an opportunity and a threat simultaneously. For Lewis he needs something unusual at some point to have a chance at the title, but also a no-score for him likely will be fatal to his chances. For Nico, he would ordinarily be looking for things to be nice and ordinary everywhere. But if he wants to get the title job finished this weekend he probably needs an extra variable. And it was reflected in their views afterwards. "Whatever the weather, I'll be ready for it." said Lewis. "I don't think of anything in terms of most to lose at the moment" said Nico. "I just look forward to tomorrow's race and whatever comes comes" the German went on. "We have a great car in either condition, in the dry and in the wet, so it will be exciting." 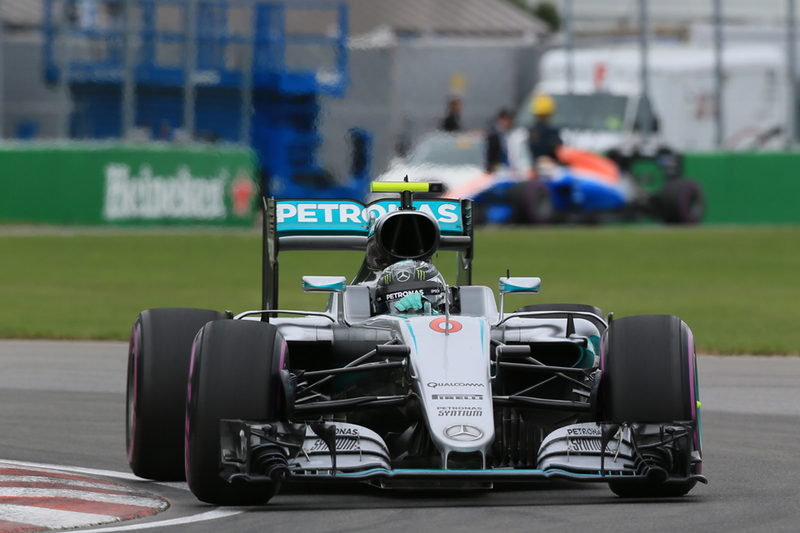 Even if rain stays away Nico thought he had opportunities to make the thing final with a win. "Of course I want to try to win the race tomorrow" he added. "The start is a possibility, strategy, the tyres are really going to struggle in the long runs because of the cold...So let's see." Kimi nevertheless seemed rather underwhelmed with his effort. "I struggled all qualifying in a few places and a few corners," he said. "To be honest, the last lap was pretty average in my view, but enough to be third. "I struggled in first two corners with tyre warm-up, middle bit not too happy - but it was good. We'll see what we can do." "Mercedes seems to be a bit too far. Hopefully we can have a good strong race tomorrow." Red Bull boss Christian Horner pointed at track characteristics though for slipping behind the red cars. "This is a big power-sensitive circuit", he said. 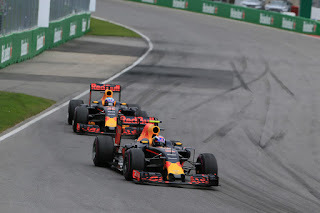 "It was a shame with Max [Verstappen] because he was two tenths up [on Raikkonen] going into turn 8, and he just got a little bit out of shape going through 8, 9 and 10 and dropped the advantage that he'd built up. "But fourth and sixth, we can have a good race from there. And if the conditions are a bit variable tomorrow anything's possible." Which was not said for nothing, as the Red Bulls are expected to be the quickest out there in the wet, and Max indeed admitted that he'll be doing a rain dance prior to the race. In any case he starts between the Ferrari pair in P4, having himself been rather consistently the top Bull this weekend. Daniel Ricciardo starts sixth. Romain Grosjean really impressed. If his Haas machine has had rather a feast or famine season this was something of a banquet, as in a single run in Q3 he bagged P7, and it wasn't even especially close as he was two tenths near enough up on the next guy and just four tenths of Ricciardo's best. 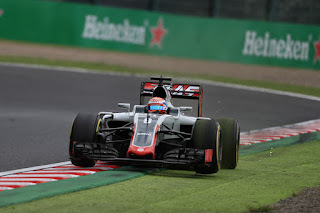 The variations in competitiveness plainly baffle the Haas team too, and it was reflected in Grosjean's words afterwards. "We were not expecting to get into Q3," he said. 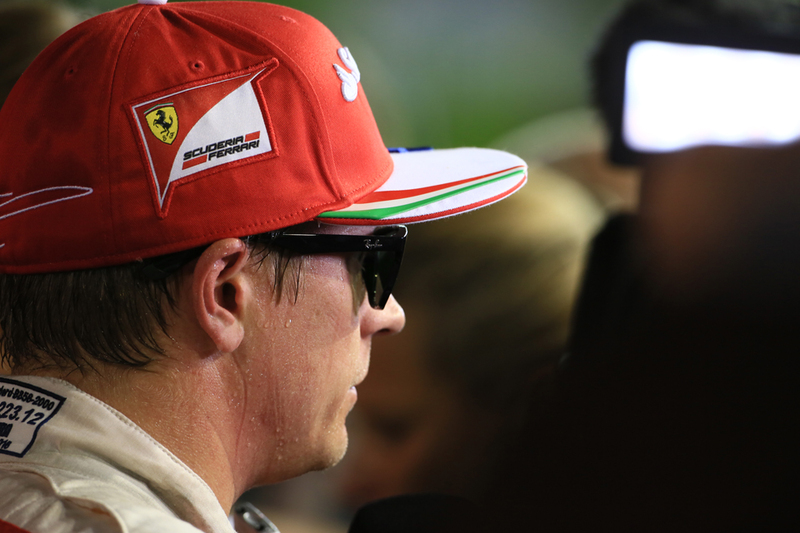 "I don't think we had a plan, pre-qualifying to go to Q3. "It's great, we've made some good work with the car. The cooler track conditions has helped us a lot and there's a lot we can learn about that. Clearly we need to improve when it's warm but when it's cold and grey as it was today we're going pretty fast so that was good." 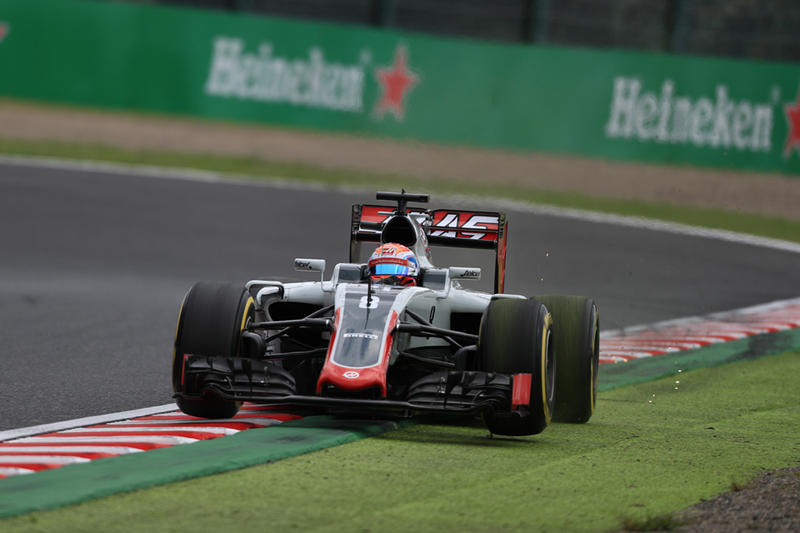 Grosjean also paid tribute to new brake materials used this weekend, which he says have improved things. The two Force Indias were next up, good for that team's constructors' title placing fight given Williams sank again. The Grove pair were topping timing screens yesterday but today neither even made the final part of qualifying. Particularly traumatic for Felipe Massa in his final home Grand Prix. Fernando Alonso impressed also to complete the top ten, and indeed he got into Q3 with the seventh fastest time. This too in a weekend wherein his team mate Jenson Button, for the third time in the last four, didn't get out of Q1. The Englishman spoke afterwards of his car's handling being unrecognisable compared with the day before. And at the sharp end, given everything, things could easily be unrecognisable tomorrow. If so it almost cannot fail to impact on the title battle.